Photo shows Manila Water Advocacy and Research Department Head Fernando Busuego (at the podium) talks about ‘Toka Toka Para sa Malinis na Ilog’ as a major intervention in helping the rehabilitation of Pasig River. 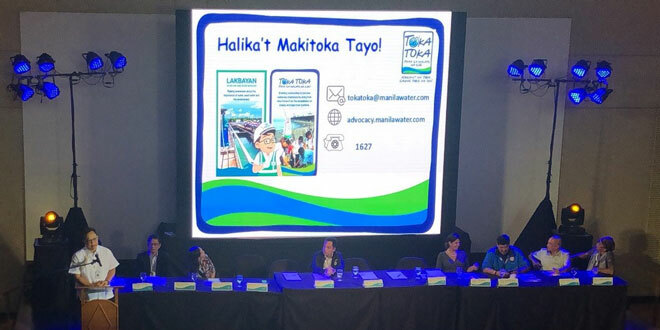 Manila Water’s Toka Toka advocacy, the first and only environmental campaign focused on the need for used water management, was featured in the recent Taga-Alog Stakeholder Conference 2018 with the theme “Taga-Alog 2018, Ilog Pasig: Balik Tanaw, Balik Sigla!”, organized and spearheaded by the Pasig River Rehabilitation Commission (PRRC), National Commission for Culture and the Arts (NCCA) and Philippine Educational Theater Association (PETA). Manila Water Advocacy and Research Department Head Fernando Busuego presented the East Zone concessionaire’s Toka Toka Para sa Malinis na Ilog during the conference as one of its major interventions to help in the rehabilitation of Pasig River. The stakeholder conference is a creative campaign for the promotion of Pasig River as a space for cultural identity and collective memory. Attended by over a hundred representatives from LGUs, NGAs, NGOs, private organizations and even students from various colleges who share the common passion and drive to do their share in rehabilitating Pasig River, the stakeholder conference aims to get more partners and secure the involvement of as many stakeholders in saving the river. Under the Toka Toka program, individuals and entities can do their share or ‘Toka’ by pledging any of the following ownable acts such as: (i) availment of desludging of septic tanks every five years; (ii) connecting to Manila Water’s sewer network, (iii) promote the formation, education and communication of community sanitation and used water programs and (iv) proper waste segregation and disposal. Manila Water is the water and used water provider of the eastern portion of Metro Manila that serves the residents of Pasig, Marikina, Taguig, Makati, Mandaluyong, San Juan, Pateros, portions of Quezon City and Manila and Rizal Province.